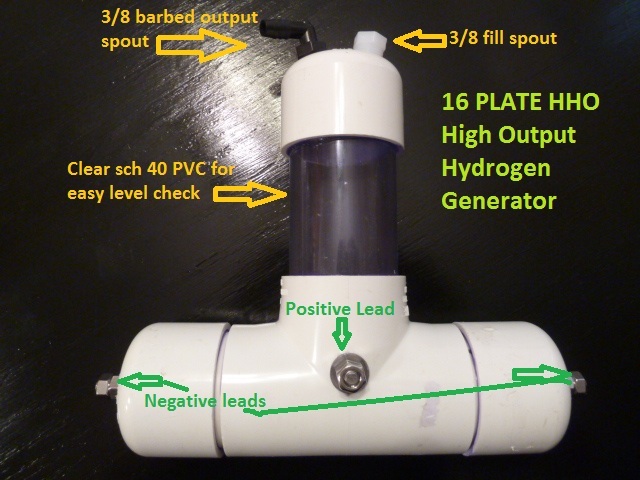 We make Hydrogen Generators for many applications. This unit is a High Output Unit that will greatly enhance gas and diesel engines. It is strongly suggested that you use a PWM (Pulse Width Modulator) so the unit will not over heat. The Pulse Width Modulator pulses the amps delivered to the hydrogen generator and keep it from getting too hot. Electrolyte is sold online at a few places and everyone thinks they have the best one. Potassium chloride is the best electrolyte for hho production and needs to be cut with an agent to keep it from foaming up if you don’t have a bubbler unit inline with your setup. I use both an electrolyte with no foam build up and a bubbler because you do not want to have any potassium chloride to get into your engine and start to break down your internal parts. We condition all of our 316 stainless steel plates both with the cross hatching and chemical cleaning needed to run a clean, high output system. We test each unit and make sure they have the output specified before shipping them out.